Rollerblade's Hydrogen Wheels are the pinnacle of performance. When you want performance, the 85mm wheels are the ones you want spinning underneath your feet. They deliver power and response with more grip to keep your steady and longevity for greater use. The urethane is a great vibration reducer which means less fatigue and more performance for longer stretches. The core of the Rollerblade Hydrogen Wheels are designed in a way to give you more flex, power and energy with each stride. 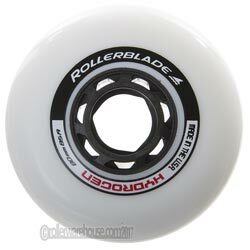 These top notch wheels are a must-have for the serious skater looking for that performance.